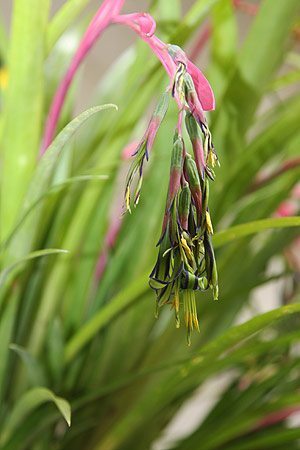 A very interesting bromeliad that grows well in hanging baskets Billbergia nutans is also known as ‘Queen’s Tears’ and the friendship plant. This is a clump forming bromeliad with rather fine strap like foliage, the flowers appear in spring on longer stems and tend to arch down gracefully. The flowers are a combination of pink, yellow and green with touches of purple to blue and they appear on tall pink stems beneath pink bracts.. Although widely grown in hanging baskets and containers this is also suitable for mass planting is shaded garden beds with good drainage. In nature, Billbergia Nutans is epiphytic so it can also be mounted if desired. Suitable for growing indoors although it is spring flowering do not be surprised if it sends out the odd flower a other times of the year as well. A form with variegated foliage is also available, but rare in Australia. This is a plant that is best grown in a container or hanging basket. A position outdoors with filtered light is best, it will grow indoors in good conditions. A position with a little extra humidity works well, so grow away from heating ducts and air conditioning. Like many bromeliads. this is a plant that requires very little attention once established, they are naturally epiphytic but can easily be grown in pots in a free draining potting mix. Try using a fine orchid bark, or a cactus and succulent potting mix. If you have a dry shaded position outside, it will also thrive. This is a frost tolerant bromeliad, it does like a little humidity in summer, so a little mist spraying will be beneficial. Billbergia nutans may be mounted on cork or wood if desired, it will also grow well in a hanging basket. If the plant is reluctant to flower, try moving it into a brighter light and this should solve the problem. A little sulphate of potash added to the watering regime in summer will help improve flowering. Provide some extra humidity during summer. Fertilise with a liquid seaweed fertiliser every 2 – 3 weeks from spring to summer. Over time Billbergia nutans will form a clump, and division of the larger clumps is the easiest form of propagation. The best time to divide these plants is in spring immediately after flowering. After dividing, this can be a plant that will not flower for a season or two, be patient and it will reward you, as once reestablished they are very reliable flowering plants. 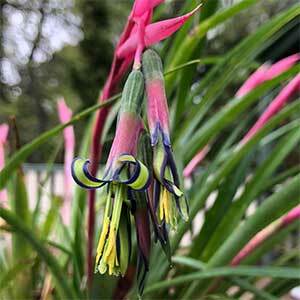 Billbergia nutans is available for sale from the following participating nurseries.